In which I provide some general musings to kick off my use of the Microsoft Band 2. My loving, sweet valentine gave me a wonderful early Valentine's Day present: The Microsoft Band 2. I charged it last night, and I'm ready to give it a try today. What follows are my preliminary thoughts, prior to any significant use whatsoever. While, I have no experience with the original Microsoft Band, the second iteration of this technology immediately appealed to me. Longtime readers already know of my affinity for fitness trackers. I started with a Nike+ GPS running watch back in 2012. That actually broke after about eighteen months of use, which made it a terrible value. Next, I tried the Garmin Forerunner 620, which I've been using since I got it back in 2013. I actually love the Forerunner. It accurately maps my runs and, with the help of a chest strap heart rate monitor, provides deep analysis of fitness data such as pace, heart rate, running cadence, elevation, VO2 max, and so on. The thing works perfectly and I've really enjoyed it. 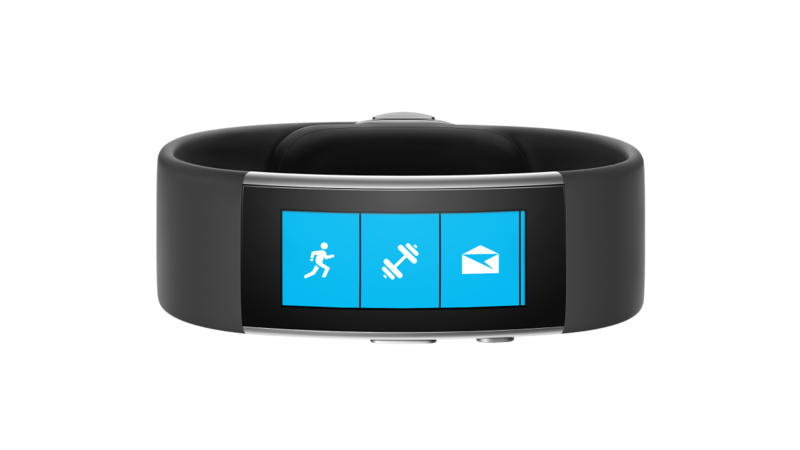 But the Microsoft Band 2 dispenses with the need of a separate heart rate monitor. It has one built right into the strap, just like a FitBit. Unlike a FitBit, however, the Band 2 has a GPS sensor. This means that I get the best of all words: I get all the GPS-based data of a Forerunner, without the need of a separate heart rate monitor, plus all the constant-monitoring data that FitBit-style trackers add. This means the Band 2 monitors my resting heart rate, the restfulness of my sleep, tracks my steps, flights of stairs, etc. The Forerunner didn't do that; it only operated during a workout. Some might ask, "Why don't you just run with your phone?" There are many reasons why I don't, but probably the most important one is: I run in spandex. There aren't a lot of places to keep my phone while I run. And I run way too intensely to carry my phone around on an arm strap or in my hand. Hence, a wrist-based device is a necessity for me. So, in short, it's the "best of both worlds" between a fitness tracker and a GPS running watch. Add to that some simple Bluetooth functionality: access to text messaging and emails, calendar, social media (if I so desire), and so on. It's not a replacement for a smart phone, but it's a handy (heh, get it? hand-y?) option for people who are keen on such things. But wait, there's more. The Band 2 also has a UV light sensor, which can advise you of your exposure to UV radiation. I'm generally pretty good about knowing when I'm exposed to sunlight, but hey, data is data. I can also connect a Starbucks gift card I have to the Band 2 and, apparently, pay electronically at Starbucks without having to pull out my wallet. I haven't tried this yet, of course, but this seems pretty nifty. How does it fit? Comfortably. It doesn't quite feel like a watch, it feels more like a bulky bracelet. The documentation recommends that you fasten it snugly to the wrist so that it doesn't move around. It's also recommended, although not necessary, to wear the Band 2 with the screen on the inside of the wrist. Some might find this annoying, but I'm pretty ambivalent here. It seems to work, so I'm okay, but I mention it for those who might expect the Band 2 to be exactly like a watch. It's not. If you like gadgets, this is a pretty good gadget to get, at least on paper. Cool stuff. Microsoft Band 2 connects to your smart phone, and subsequently the cloud, via the Microsoft Health app. The mobile app provides a user interface through which to adjust the settings and preferences on the Band 2. So, for example, if you are interested in running, but not golfing, then you can use the app to activate the running "tile" and deactivate the golf "tile." Here you can also activate the social media tiles, or not, as the case may be, set your height, choose between Celsius and Fahrenheit, and so on. From there, the app gives you access to some basic statistics: steps, heart rate, sleep information, and activity information (when you actually log a workout). This is pretty standard fare. The browser-based interface then provides access to even deeper dives of the data. For example, you can see a breakdown of your restful vs. light sleep, and how that compares over time, and how it compares to other people who match your demographic profile. You can see what percentage of calories burned were burned while sleeping, while going about your day, and while working out. And so on, and so forth. Microsoft has then taken the Band 2 into even better territory. First, Band 2 connects to a great many third party apps, such as Strava, MapMyRun, MyFitnessPal, and so on. Recall that level of extended connectivity proved to be a challenge with my Garmin Forerunner. I'm not sure that the Band 2 is on speaking terms with Google Fit, but I'm also utterly certain that it isn't necessary. Microsoft Health ultimately proves to be the central repository of health data, through which most other apps can easily connect. Or is it? More on this below. The notable exceptions seem to be Google Fit, Garmin Connect, and Samsung S Health. These latter two interfaces are only relevant to people who own Garmin devices (i.e. not necessary if you're using a Band 2) or Samsung smart phones. It's true, I'd appreciate it if the Band 2 could interface with S Health, but it's so easily connected to so many other apps that this is a little too much for me to ask of the Band. I said before that Microsoft Health seems to function as the central repository of health data. That's not entirely true. Microsoft Health seems to be the central repository of fitness data. This can interface with Microsoft's borader health data app, called HealthVault. It is here that users can connect fitness data with all their other health data, such as blood pressure readings, prescriptions, medical records, family medical history, and - for me, crucially - blood glucose readings. Many users will understandably feel some reluctance to give the system access to their private medical data. I, by contract, am keep to subject my health data to as many analytical algorithms as possible, in hopes of gaining ever-better control over my blood sugar. I don't mind being a guinea pig here if it means I can lower my HbA1c. So with this near-total, 360-degree health data interface, fed by the Microsoft Band 2, I'm feeling optimistic about the overall value proposition of the Microsoft Band 2. I seem to have access to every piece of data that's important to me, most of which is tracked and analyzed without my having to think about it, other than simply logging the data. I'm running basically a single device - the Band - and using it for everything. I'm excited to see how this all pans out for me. I'm just about to head out for my first run with the band. I'll let you know how it goes.